To say that I am excited for the book launch party, is understatement of the year!! I am beyond ecstatic to celebrate the completion and publishing of my first book!! 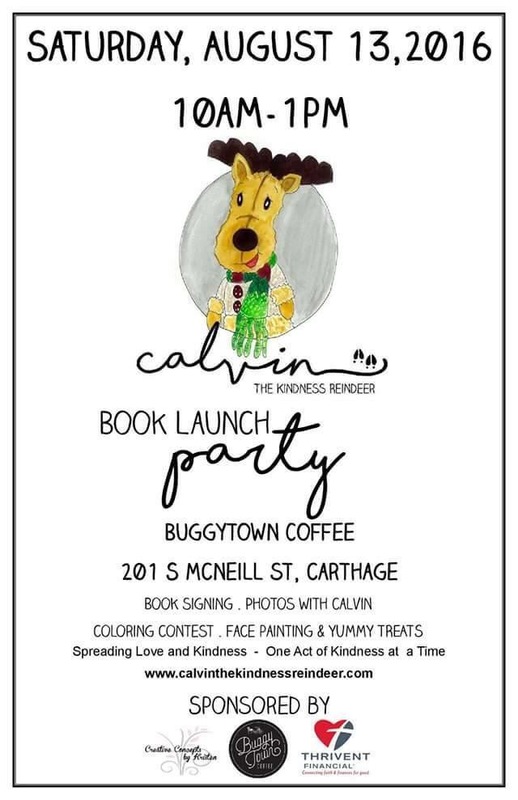 Not only will it be a celebration, it will also be a kickoff party to our Moore County Kindness Mission! This is a way that we are getting our community involved in doing kind things for others on a daily basis and not waiting to be asked to do things. We will have so much going on during the party: face painting, photos with Calvin, coloring contest, door prizes and some yummy treats!! My brain is going a mile a minute with ideas and things that need to be done! But no matter what ends up happening that day, good bad or ugly, I know it will be awesome!! !